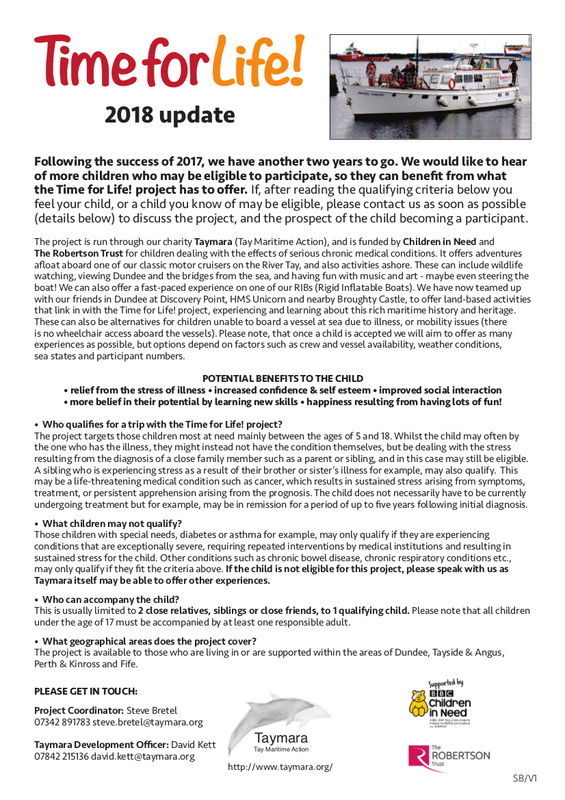 This Taymara Heritage Education (THE) project will support young people whose curiosity about the heritage of the River Tay has been primed by respite river trips, run, for children stressed and affected by severe ill-health. THE project will convert children’s curiosity, into learning about the extent and detail of the heritage along the River Tay, extending the initial detail they glean from their river trips. THE project will target 60 children, in groups of up to 30 children each year for two years. Each year group will study the heritage of a different geography linked to the river. Each year group will further divide into three teams, 10 focusing on maritime, 10 on built and 10 on environmental heritage within that year’s geographical boundary. The teams will be supported by experts in the three themes of maritime, built and environmental heritage, by our staff and volunteers and by those who manage specific heritage assets and data. While each team will concentrate on their own theme the teams will come together quarterly to share what they have learned. A hectic season in 2015, lasting from May until the end of October, saw us take a total of over 300 carers and their cared-for out on the river. The passengers, coming from Angus, Fife and Perth and Kinross, were treated first of all to a lesson in boat driving which was held in Victoria Dock, Dundee, a session on how to tie knots, and a tour of the North Carr lightship. They then proceeded out to sea on Badger for trips of varying lengths. As with the project for children, they were given extensive tutorials and they thoroughly enjoyed driving Badger. The dolphins were the star turns, most of the passengers never having seen them close up before. This project was funded by Shared Care Scotland. We had a fabulous and memorable afternoon on Badger. Thank you so much. This ran until the end of 2017 and was resourced by the Big Lottery Fund. Young Start trained prisoners aged 20-24 in vocational and transferable skills which enhanced CVs thus improving their chances of gaining employment. The qualifications enable them to take up paid work on safety boats and other commercial vessels once they leave prison. Challenging though the programme was, often operating in the open during periods of inclement weather, it was consistently the most popular on offer at Castle Huntly open prison. Together with its partner programme B.O.A.T., variously funded by the Voluntary Action Fund and Comic Relief, Young Start trained 44 prisoners to a high standard whereby they achieved three internationally recognised qualifications. That’s the best fun I’ve had since I was a kid. This project provides positive and stimulating experiences for children mainly between the ages of 5 and 18 who are affected by a medical condition such as cancer. 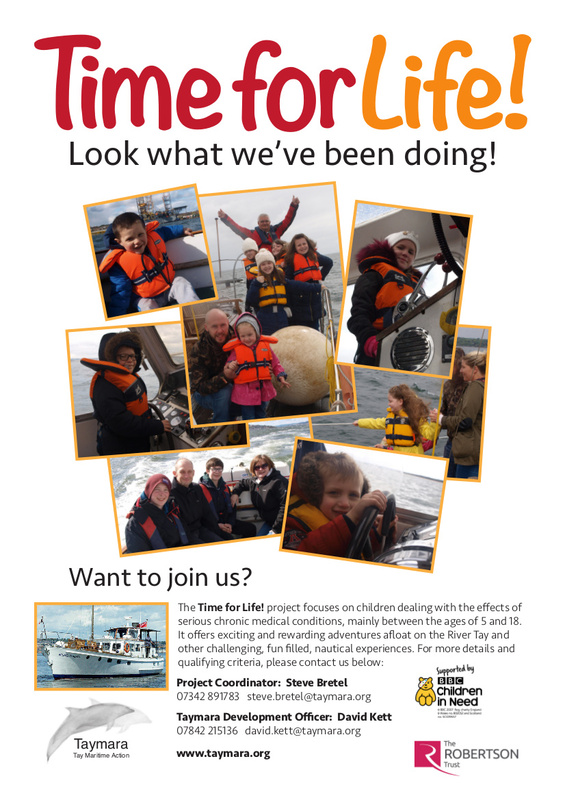 Funded by Children in Need and The Robertson Trust, it will provide interest and activities to relish and share, including the thrill of riding on a range of vessels from a fast rigid inflatable to a 40 ton launch. Not only will the children have the opportunity to watch a variety of wildlife such as dolphins and seals, they will also be given an appreciation of the many secrets held by the United Kingdom’s largest river in terms of outflow. Heritage, history, environment and industry will all be covered by our expert guides. The children will be introduced to various milestones in the river’s history, visiting for example the precise site of the Tay Bridge Disaster, and they will view the workings of Dundee’s modern port facilities from the seaward side. Time for Life! Look what we’ve been doing. Time for Life! 2018 update.